When I tell people I am a chemist the most common response is, “Oh man, I hated that in school, especially organic chemistry!” That's an unfortunate but reasonable response. Trying to understand these tiny things called molecules that are impossible to see can be kind of like learning about a never-to-be-seen dimension in which up is down and left is orange. Thinking about chemicals can be very disorienting. Image via Andrew Lipson. I love chemistry though because the shapes of these molecules scribbled on the chalk board actually have consequences that we can see in the world. The changing color of leaves on the approach of winter is caused by actual changes in the structure of the matter of which those leaves are made. The effects of the diversity of molecular shapes in the world around us can actually be SEEN with our eyes! 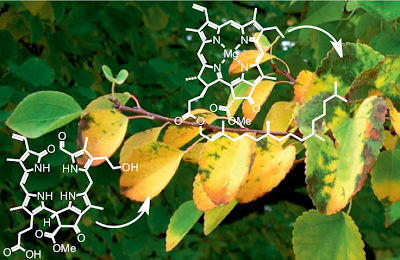 Green and yellow leaves on the Katsura tree with the chemicals responsible for those colors (chlorophyll a and yellow-chlorophyll-catabolite, respectively). 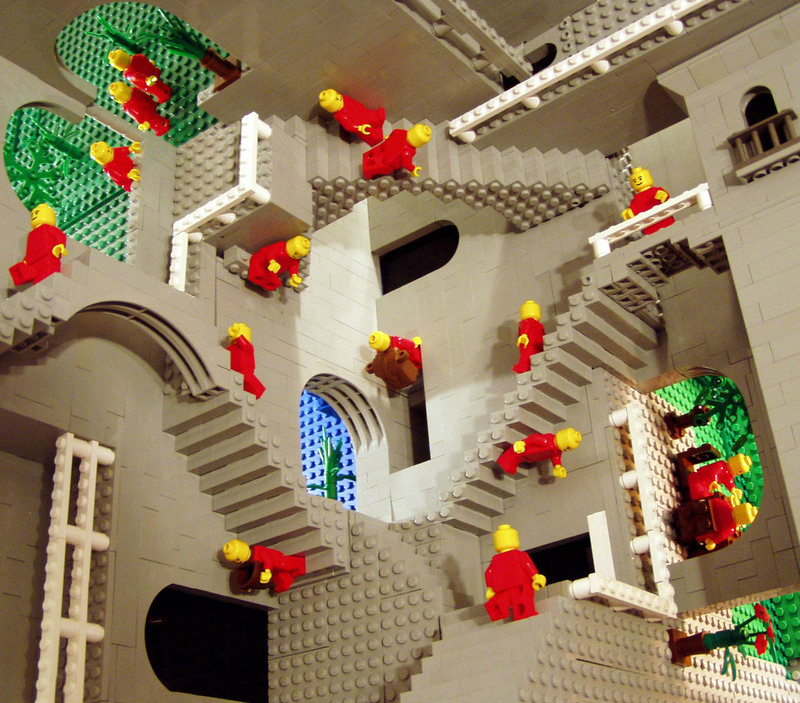 Image and knowledge via Krautler et. al. When someone tells me they are a biologist my most common response is, “Oh man, biology is so complicated!” It seems so daunting to me to move beyond a simplistic description of aspects of life such as "chemical X results in color Y" and actually try to understand the nearly unfathomable diversity of chemicals that come together to make each living thing unique. Not to scale. 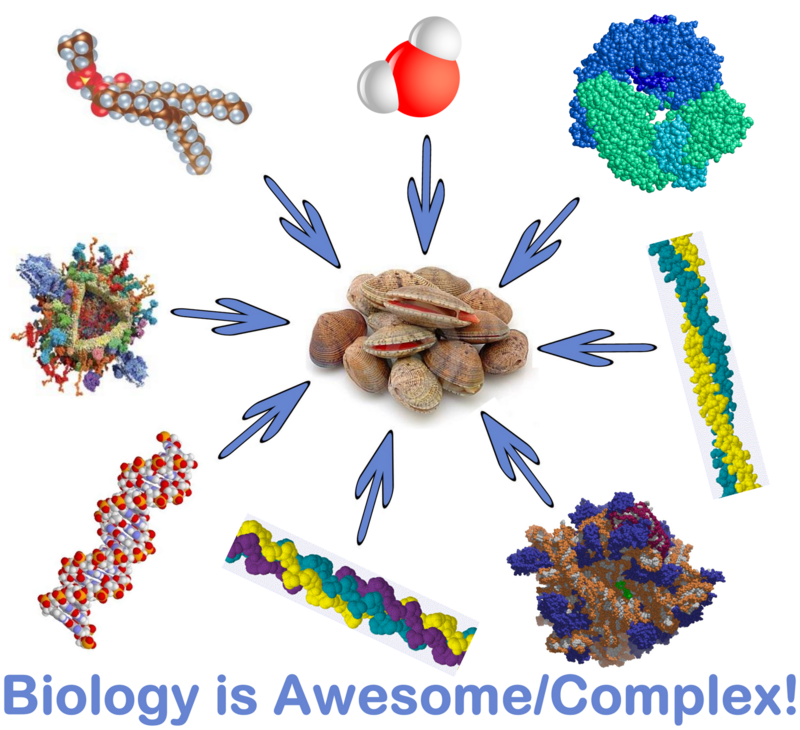 Clams are way bigger than DNA, which is way bigger than water. I am certainly not capable of crafting a simple yet complete description of how the shapes of the molecules that make up living things contributes to those things' visible shapes, sizes, and colors. Fortunately, where my scientific brain fails, an artistic brain succeeds. Video artist and experimental animator David C. Montgomery has created a beautiful video capturing the diversity of shapes, patterns, and colors that are present within several different species of life. When watching this video (full screen it!! ), try and think about how all of the differences you see are caused by differences in the shape, arrangement, and composition of the unimaginably tiny and diverse molecules of which the living things are composed. Experiments at Home #2 - "Skillet Control Oven"
In my last post I showed how my skillet was coated in liquid after a short stay in my pre-heating oven. I guessed that the liquid was water and that it came from the burning of natural gas. Though I was quite confident in my guess, I admitted I hadn't done any other experiments to show that the liquid actually was water. This is my oven! Definitely try this at home!!! 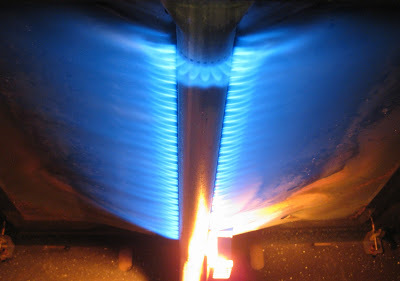 If you want to know why the flame is blue, check out this post.